Museums and attractions around St Paul's Hill. Click on the labels for details. Photo taken from the Taming Sari tower. 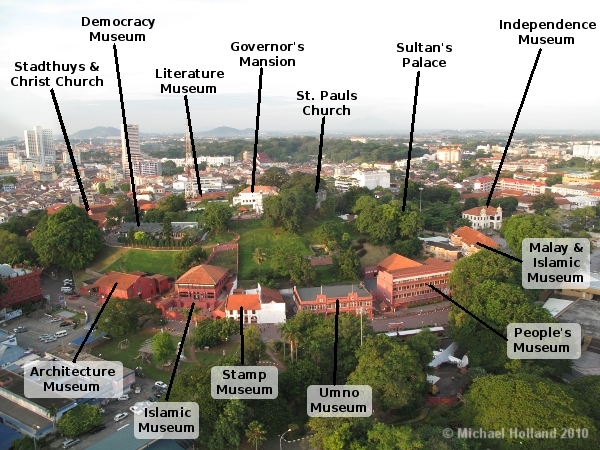 The area around what is now called St Paul's Hill has been the center of Melaka since it's founding in the fifteenth century. It is also called Bukit Melaka and Bandar Hiler in Malay. The hill is dotted with the remains of the Portuguese, Dutch and British colonizers, and so now is something of a museum district. There are now more than a dozen museums on the hill and around its base. If approaching the hill from Chinatown, you will first come to the old town square. You can climb the hill up to St Paul's Church using the stairs leading to the entrance of the Stadthuys, or you can turn right and follow the road (Jalan Kota) at the base of the hill, which will bring you to several of the museums and eventually to the ruins of the A'Famosa Fort. Behind the old gate another stairway head up to the top of the hill. There are, in fact, several paths up and around the hill, which is probably why it's a popular exercise spot in the early evening.